Here’s a good reminder to lock your car doors: If you don’t, a group of bears could break into it and eat all your possessions. Don’t believe me? 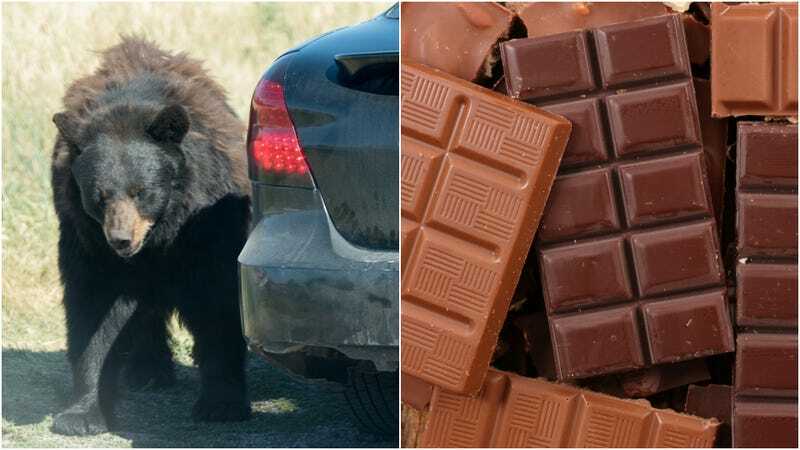 Watch this video recorded by Asheville, North Carolina 16-year-old Lilly Thurmond, who filmed four bears rummaging through her Toyota Prius, eating the chocolate bars contained therein. The bears had a real dessert buffet, as Thurmond’s car contained 50 chocolate candy bars she was planning to sell for a high school fundraiser. News station WLOS reports that after the bears had their way with the dark chocolate, milk chocolate, and almond bars, there was just a single one left. I’m glad this video exists so we can watch these very stoked bears devour some chocolate, but I know I wouldn’t have managed to stay this calm if some bears were ripping apart my Camry. There would have been much more screaming, is all I’m saying—not least of all because I wouldn’t have any candy left.